E3 returns to the LA Convention Center with fewer companies and shorter walking distances. Activision and Vivendi won't be attending, but 39 companies are still scheduled to appear at the E3 2008 Media and Business Summit. This year's event is expected to draw 4,000 visitors from within the industry and media personnel to the Los Angeles Convention Center, the site where the majority of E3 events have been held. The center's Concourse Hall will be the only wing of the building in use, a massive downsizing from past LA shows. Well you'll have to chain me to a desk to stop me from going! Perhaps not, although I am surprised that Valve and Take-Two are turning out. Does that mean that both of them have something tricky up their sleeves? Even so, will they even bother to present it at E3? I'm sure Steam or their own PR sectors can make a bigger deal out of upcoming releases than the backwater presshounds that frequent the recent E3s ever could. Talking of 'backwater presshounds' - FOX? Warner Brothers? MTV Games?! 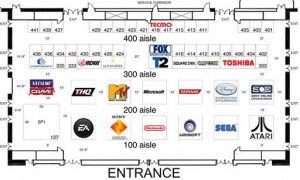 I can see all of these companies for free at my own comfort, now in an over-crowded, sweaty convention hall! Could there be some news on Sonic Unleashed???? ?